My mom had made me machine-embroidered hand towels to use as burp cloths, but because we used so many I saved them for when we went out and mostly used the receiving blankets and hand/kitchen towels around the house. 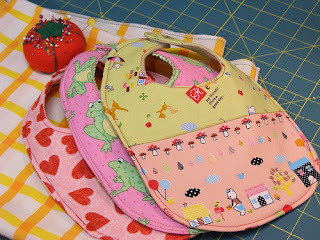 So she told me that she would make them into bibs when I didn't need them as spit cloths any more. Needless to say, mom had to make bibs out of new ones because she was eating solids long before the reflux spitting stopped (nearly a year). Well finally when I was thinking what would make a good gift for my cousin that was expecting I bought some cute flannel fabric and some terry cloth in a solid that matched and cut them into large squares (not as large as most diapers but definitely larger than a fingertip towel or any burp cloth you buy in the store) and had my mom use her serger to sew around them so they were finished off. By then Meg was about 8 months so I only kept a couple for myself and gave the rest away as gifts. They're the best we've used. But for next time I have a few ideas about making some multi-purpose cloths that are a terry/flannel combo. I'm thinking of making them the size of a newborn prefold or twice the size of a liner insert and then they could be rolled up and put in the diaper bag to be used for burp cloths, wipes (I carry a spray bottle of water instead of keeping them wet), or a diaper insert when we get to the point of needing them. I thought that way I wouldn't have to worry if I had all of those separate things when we went out. Now I often try to include a larger prefold in the bag that can be used as a changing pad or if I decide to stay at my parents or my sisters at the spur of the moment I use it to as a doubler for the nighttime diaper. That's way I wanted to make these a size that was convenient to just fold over and use as a doubler.